Can you please provide some details regarding Qurbani, especially the rules regarding having one’s Qurbani done in UK slaughterhouses? ‘Udhiya’ is an Arabic term which means ‘sacrificing an animal’, and ‘Qurbani’ is an Urdu and Persian word derived from the Arabic word ‘Qurban’ which literally means an act performed to seek Allah’s pleasure. It is technically used for the sacrifice of an animal slaughtered for the sake of Allah. Who is required to Perform Udhiya? Every adult Muslim, male or female, who owns 612.36 grams of silver or its equivalent in money, personal ornaments, stock-in-trade or any other form of wealth which is in excess of one’s basic personal needs, is under an obligation to offer the ritual slaughter (Udhiya). Each adult member of a family who owns the above-mentioned amount must carry out his or her own Udhiya separately. If the husband owns the required amount but his wife does not, then slaughtering will be obligatory on the husband only, and vice-versa. If both of them have the prescribed amount of wealth, then two separate Udhiyas will need to be performed. If the adult children live with their parents, Udhiya is obligatory on each one of them possessing the prescribed amount. The ritual slaughter offered by a husband for himself does not fulfil the obligation of his wife, nor can the Udhiya offered by a father discharge his son or daughter from their obligation; rather, separate sacrifices will have to be carried out for each individual possessing the required amount. A husband or father, apart from offering his own ritual slaughter, may offer another on behalf of his wife or son, with their permission. 1) Udhiya is only valid during the three days of Dhu’l-Hijjah, namely the 10th, 11th and 12th, and cannot be performed in any other day of the year. 2) Although Udhiya is permissible on each of the above three days, the first day (i.e. the 10th of Dhu’l-Hijjah) is the most preferable and desired day. 3) Generally, Udhiya is not allowed before Eid Salat. If Udhiya is being done at a place where Eid Salat is not performed, the slaughter should commence after the completion of Eid Salat in the nearby town/city. However, according to the Hanafi School, in small villages where Eid prayer is not to be performed, Udhiya can be offered any time after the break of dawn on the 10th of Dhu’l-Hijjah. 4) Udhiya can be performed during night time. However, it is preferable to perform it during the daytime. 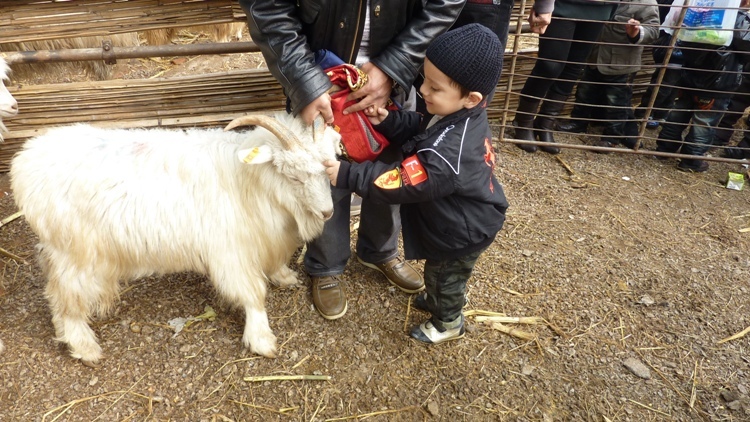 1) The animals eligible for Udhiya are goats, sheep, cattle and camels, male or female. No other type of animal is allowed for Udhiya. 2) Castrated animals may be used for Udhiya. 3) Barren animals may be used for Udhiya. 4) Goats and sheep have to be at least one year old. However, a healthy sheep that looks like a one year old may also be used, provided it is at least six months of age. 5) Cattle (cow, ox and buffalo) must be at least two years old. 6) Camels must be at least five years old. 1) An animal that was born without horns or the horn is broken off from the middle is eligible for Udhiya. However, if the horn is broken off from the root, or the horn has been uprooted, then it will not be eligible for Udhiya. 2) An animal that is totally blind or has lost one-third or more of its eye-sight, or one-third or more of one of its ear is cut, or one-third or more of its tail is cut, is not eligible for Udhiya. 3) An animal which limps/walks on three legs and cannot put the injured (4th) leg onto the ground, or it is able to put the injured leg onto the ground, but is unable to walk on it, is not eligible for Udhiya. However, if it is unable to walk on it, but can still take support from it, then it is eligible for Udhiya, even though it is limping. 4) Animals having no teeth at all are not eligible for Udhiya. If an animal has lost some teeth only, and has most of its teeth, it is eligible for Udhiya. If most of the teeth are lost, it is not eligible for Udhiya. 5) An animal born without ears is not eligible for Udhiya. An animal with very small ears is eligible for Udhiya. 6) Thin and extremely weak animals, unable to walk to the place of slaughter, are not eligible for Udhiya. 7) If an animal sustains an injury whilst being slaughtered, the Udhiya is valid. 8) If an animal is purchased in a healthy and eligible state, and thereafter, an accident occurs which renders the animal unfit for Udhiya, then in such a case, if the purchaser is no longer wealthy (owner of the required amount) it will be permissible to offer the same animal for Udhiya. However, if the purchaser is wealthy, then it is necessary to obtain another animal in place of the injured animal. 9) If an animal purchased for Udhiya gives birth (before being slaughtered), then the newly born animal should also be slaughtered. 1) It is important that the animal is purchased before the Udhiya is performed, or at least, specified for purchase and Udhiya on behalf of the one wishing to perform Udhiya. This should be done by tagging a label on the animal which displays the individual’s name or an assigned number. 2) If multiple Udhiya orders are placed through an agent (such as the butcher), the agent should list all the names with exclusive numbers and keep them securely. The agent should also at this stage provide the customer with his assigned number for his information. Thereafter, the complete list should be forwarded to the abattoir before Udhiya commences. a) Label or tag the animal with the name of the agent/butcher and his customer: e.g. (butcher/agent) XYZ & (customer) XYZ. b) Label or tag the animal with the name of the butcher/agent and specified Udhiya number: e.g. Butcher XYZ Customer No 1, Butcher XYZ Customer No 2, Butcher XYZ Customer No 3, and so on and so forth. As such, each animal must at least be numbered and this must be done before slaughter or at the latest when brought into the slaughter bay. Mere slaughter without specification is not sufficient even if the intention is to specify and number the carcasses at a later stage e.g. whilst loading. 4) Finally, care should be taken that each individual receives his specified and numbered carcass after slaughter and after implementation of the subsequent processess. ‘Abdullah Butchers’ has an order of 50 Udhiyas. He makes a list of the names of customers who have placed an order with him and assigns a specific number for each individual customer, e.g. Muhammad – 1, Ismail – 2, etc. A copy of this list is then given to the slaughterhouse and one copy retained by the butcher. When each animal is about to be slaughtered, the slaughterers specify that this particular animal is for order number x of ‘Abdullah Butchers’. The slaughterer then labels the animal accordingly to distinguish it as that particular Udhiya, so that when the order is collected or delivered, the butcher clearly identifies which customer’s Udhiya it is, according to the list he had drawn up. 1) It is recommended (mustahabb) that the owner of the Udhiya animal slaughters it personally, provided he is able to slaughter properly. If the owner is unable to slaughter, it is better to delegate the task to another Muslim who is acquainted with the requirements of a valid Islamic slaughter. If the slaughter has been delegated, it is desirable that the owner of the Udhiya animal is present at the time of slaughter. 2) The Islamic slaughter requires that the throat, the external jugular veins and the wind-pipe of the animal is swiftly and clearly severed with a sharp tool, together with invoking the name of Allah Most High. If only two of the passages and veins are cut, the slaughter will be deemed incorrect. If any three of the four are severed, the slaughter will be valid. 3) It is Mustahabb to face the Qibla while slaughtering. 4) It is preferable to sharpen the knife before slaughter to ease the suffering of the animal. 5) After slaughter, the animal should not be skinned or cut up into pieces before it turns completely cold. 6) It is disliked to slaughter an animal in the presence of another animal, although the slaughter is valid. Whilst slaughtering the animal read, ‘Bismillah Allahu Akbar‘ (In the name of Allah, Allah is the Greatest). If the above are not memorized, then make intention of Udhiya and merely recite ‘Bismillah’ and the Udhiya will be valid. 1) It is allowed for the one performing Udhiya to either eat off the meat or give it to whomsoever he pleases, rich or poor, Muslim or non-Muslim. It is preferable, however, that the meat is divided into three parts: One part for the home, one part for relatives and friends, and one part for the poor and needy. 2) The meat or skin of the animal cannot be sold, or given to an employee or butcher in payment of his labour. It may be given as a gift. The skin of the Udhiya animal can be kept for personal use or given to anyone else for their personal use. If the skin is sold, it is necessary to give the money accrued in charity as Sadaqah. a) Sacrifice that is carried out as expiation (kaffara) for a mistake committed during Hajj. b) Sacrifice carried out for a deceased person due to his bequest (wasiyya). c) Sacrifice carried out due to a vow (nazr). The meat of the above-mentioned 3 types of sacrifices must be distributed to the poor and needy only. If an animal is sacrificed on behalf of more than one person, like a cow or camel, its meat should be divided equally among its owners based on weight, and not randomly or by mere conjecture. Even if all the partners agree on its distribution without weighing, it is still not permissible according to Shariah. However, if the actual weighing is not practicable due to some reason, and all the partners agree to divide the meat without weighing, distribution by guess can be done with the condition that each share necessarily contains either a leg of the animal or some quantity of its liver. Some people think that instead of offering a ritual slaughter (Udhiya), they can give its amount to the poor as charity. This attitude is totally wrong. In fact, there are different forms of worship obligatory on Muslims. Each one of them has its own importance and none of them can stand for the other. It is not permissible for a Muslim to perform Salat instead of fasting in Ramadhan, nor is it permissible to give some charity instead of observing the obligatory Salat. Similarly, Udhiya is an independent form of worship and cannot be discharged by spending money in charity. However, if an individual, out of ignorance or negligence, could not offer it on the three prescribed days (10th, 11th and 12th of Dhu’l-Hijjah) then, in that case only, he can give the price of a ritual slaughter (Udhiya) as Sadaqah to those entitled to receive Zakat. But during the days of Udhiya, no Sadaqa can discharge this obligation. It is Mustahabb (and not necessary) for the one intending to perform Udhiya to refrain from cutting hair or clipping nails from 1st of Dhu’l-Hijjah to the 10th of Dhu’l-Hijjah, (i.e. until the days of Udhiya have passed). 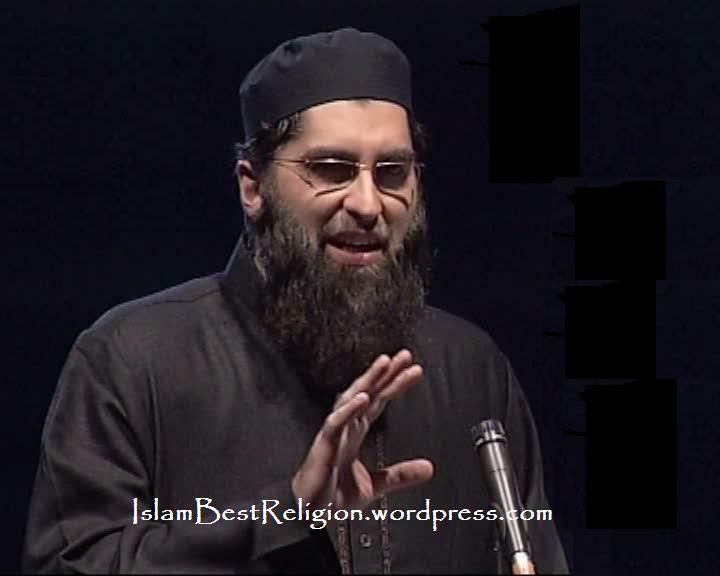 Junaid Jamshed released his latest Album in Ramadan 2011, His beautiful voice inspires many people. he is renowned Nasheed singer.He is also a Great da’iee ( One who propagate True Teachings of islam). Junaid Jamshed Latest Album 2011. Arsh : The throne of Allah Ta’ala. Banu Isra’eel : Literally means the children of Isra’eel. It refers to the progeny of Hadrat Ya’qub alayhis salaam. Barakah : Literally means “blessings”. It refers to the experiencing of abundance in things which are apparently insignificant or little,both in value and amount. Burqah : A head covering worn by women. 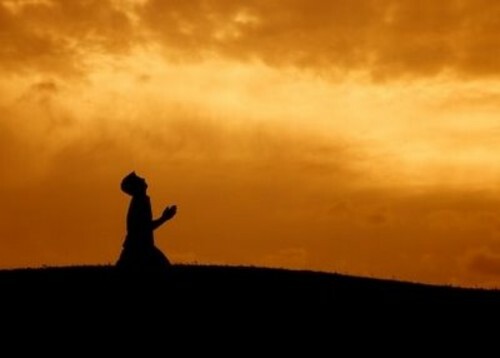 Dua : Invocation to Allah, supplication, prayer, request, plea. Durood : The sending of salutations upon Rasulullah sallallahu alayhi wa sallam. Eid ul-Ad’haa : The 10th of Zil Hijjah. Literally means “the festival of sacrifice”. It is referred to as ad’haa because it is on this day thatanimals are sacrificed in the name of Allah and for His pleasure alone. Eid ulFitr : The first day of Shawwaal. Literally means “feast of breaking the Ramadaan fast”. It is referred to as fitrbecause it is on this day that the month-long Ramadaan fast comes to an end. Fard : Literally means “compulsory”. In Islam it refers to those acts and things which are compulsory on a Muslim. Abandoningor abstaining from a fard act is a major sin. Rejecting a fard act amounts to kufr. Ghayr mahram : Refers to all those people with whom marriage is permissible. Based on this, it is also incumbent to observepurdah with all ghayr mahrams. Haid : Monthly periods or menstruation experienced by a woman. Hoor : Large-eyed women of paradise promised tothe believers. Ibaadah : Literally means “worship”. In Islam it refers to all those acts with which one renders worship to Allah Ta’ala. Iddah : In Islamic law it refers to the period of waiting during which a woman may not remarry after being widowed or divorced. Iftaar : The time of opening one’s fast. This time commences immediately after sunset. Ihraam : Two pieces of unstitched cloth which are donned by the person performing hajj or umrah. Jumu’ah musjid : Refers to the musjid in which jumu’ah salaat is offered. It is also referred to as a jaame musjid. It is generally the mainmusjid in a town or city. Kaafir : Literally means a “disbeliever”. In Islam it refers to one who rejects Allah and does not believe in Muhammad sallallahu alayhiwa sallam as the final messenger of Allah. Kaffarah : Literally means “penance, atonement, expiation”. In Islamic law it refers to redemption from the omission of certain religiousduties by a material donation or a ritual act. Kalaam-e-majeed : Refers to the Holy Quran. Kalimah : Refers to the basic tenet of Islam, i.e. bearing witness that there is none worthy of worship except Allah and thatMuhammad is the messenger of Allah. Kuffaar : Plural of kaafir. Kufr : Refers to the state of disbelief. Kurta : An Urdu word meaning “shirt”. However, due to constant usage, it refers to the long flowing robe worn by Muslim men andwhich has come to be regarded as an Islamic dress. Lungi : A loin cloth worn by men especially in eastern countries. A lungi is wrapped around the waist and extends up to the ankles. Mahram : Refers to the person with whom marriage is not permissible and with whom strict purdah is not incumbent. Makruh : That which is disliked or detestable but not forbidden. Meelad : Literally means “birth, birthday”. In this context it refers to the birthday celebrations held in respect for Rasulullahsallallahu alayhi wa sallam. In most cases these celebrations are innovations which are accompanied by many other evils. Miswaak : A thin stick or twig which is used to clean the teeth. Mt. Uhud : Name of a mountain outside Madinah. 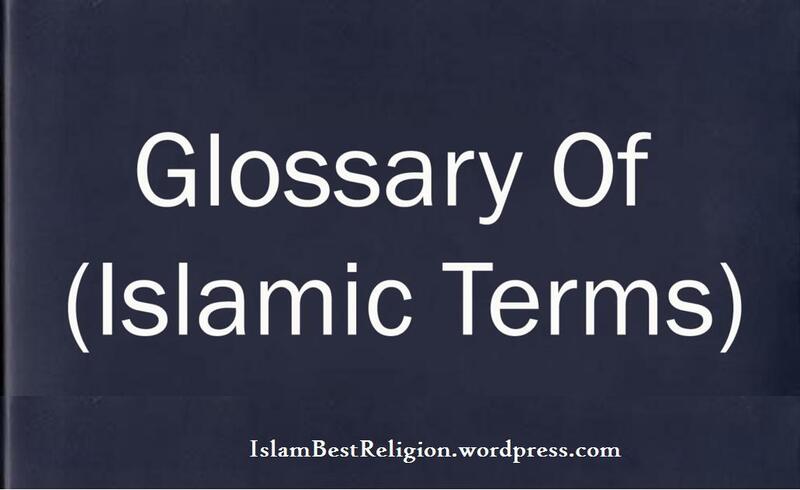 Muharram : The first month of the Islamic calendar.Mustahab : That which is preferable or desirable. Nafl : That which is optional. Nifaas : Refers to the flowing of blood after child-birth. Purdah : An Urdu word meaning “seclusion”. It is an equivalent of the Arabic word “hijaab”. Refers to the seclusion of women fromstrangers. There are different stages of purdah, the highest of which is that the woman should not come out of her home except for avalid Islamic reason. Qada : Literally means “carrying out or fulfilling”. In Islamic jurisprudence it refers to fulfilling or completing those duties that one mayhave missed due to some reason or the other. Qiblah : The direction in which one faces when offering salaat. Qiyaamah : The day of resurrection. Qurbaani : Literally means “sacrifice”. In Islam it refers to the sacrificing of animals solely for the pleasure of Allah Ta’ala on the day ofeid ul-ad’haa and the two days following it. Rajab : The seventh month of the Islamic calendar. Rakaat : Literally means “bending of the torso from an upright position”. In kitaabus salaat it refers to one unit of salaat whichcomprises of the standing, bowing, and prostrating postures. Ramadaan : The ninth month of the Islamic calendar. Sadaqah : Literally means “charity”. This word is also used as an equivalent of zakaat. Sadaqatul fitr : Refers to the charity that is given on or prior to the day of eid ulfitr. For further details, refer to the chapter onsadaqatul fitr. Sajdah : The act of prostrating. Salaam : Literally means “peace”. In salaat it refers to the saying of “as salaamu alaykum wa rahmatullah” which denotes theend of the salaat. It is also a way of greeting among Muslims. Satr : An Urdu word derived from the Arabic “sitr”, which means “cover, shield”. In the Urdu context it refers to that area of the bodywhich has to be covered. It is also referred to as the “aurah”. Sehri : Refers to the meal partaken before dawn by the person who intends fasting. For further details refer to the chapter on sehriand iftaar. Sha’baan : The tenth month of the Islamic calendar. Shirk : Polytheism or ascribing partners to AllahTa’ala. Subah saadiq : Literally means “true dawn”. It refers to the time when whiteness (brightness) can be noticed on the breadth ofthe horizon. It is at this time that the time of fajr salaat commences. Sub’haanallah : Means “glory to Allah”. Sufis : A term used to refer to mystics or saints. Such persons are also known as the auliyaa of Allah, i.e. the close friends ofAllah. These are the persons who have dedicated their entire lives in the ibaadah of Allah Ta’ala. Surmah : Antimony. A black powdery substance that is applied to the eyes. It is sunnah to apply surmah. Tasbeeh : Saying “sub’haanallah”. A rosary that is used to glorify Allah Ta’ala is also called a tasbeeh. Umrah : Commonly referred to as the lesser pilgrimage. It is similar to hajj with the exception that many of the rites of hajj are left outand that it could be performed throughout the year. Wajib : Literally means “obligatory’. In Islamic jurisprudence it refers to that act which has not been established by anabsolute proof. Leaving out a wajib without any valid reason makes one a faasiq and entails punishment. Zikr : The remembrance of Allah Ta’ala. Zil Hijjah : The last month of the Islamic calendar. Zil Qa’dah : The eleventh month of the Islamic calendar. This huge man (Amr bin abdu wud) was of a tremendous height and bulk, and while on his feet would tower above his fellow men. Sitting on his great horse, he looked positively unreal. Big, strong and fearless, he had a fierce countenance-an aspect which thrilled his comrades and dismayed his enemies. This was Amr bin Abdu Wud. (We shall call him the Giant!) Horse and rider stood motionless as he let his gaze wander scornfully over the ranks of the Muslims. The challenge was received by the Muslims in silence. They looked at one another. They looked at the Holy Prophet. But no one moved, for the Giant was famous for his strength and skill, and though wounded several times, had never yet lost a duel, nor spared an opponent. It was said that he was equal to 500 horsemen; that he could lift a horse bodily and hurl it to the ground; that he could pick up a calf with his left hand and use it as a shield in combat; that he could… The stories were endless. The vivid Arab imagination had created around this formidable warrior a legend of invincibility. So the Muslims remained silent, and the Giant laughed with contempt-a laugh in which the Quraish also joined, for they stood quite close to the ditch and could see and hear all that went on. “So is there none among you who has the courage of a man? And what of your Islam? And your Prophet?” At this blasphemous taunt, Ali left his position in the front rank of the Muslims, approached the Holy Prophet and sought permission to engage the challenger and silence his insolent tongue once and for all. The Prophet replied, “Sit down. This is Amr!” Ali returned to his position. This sword which the Prophet now gave to Ali had once belonged to an infidel by the name of Munabba bin Hajaj. This man had been killed at the Battle of Badr, and the sword had come to the Muslims as part of the spoils of war. The Prophet had taken the sword for himself. Now in Ali’s hand this was to become the most famous sword in Islam, killing more men in fair combat than any sword in history. This was the Zulfiqar. Ali hastily collected a small group of Muslims and strode out towards the unbelievers. The group stopped at some distance from the Giant, and Ali stepped forward and got to within duelling distance of the challenger. The Giant knew Ali well. He had been a friend of Ali’s father, Abu Talib. He now smiled indulgently at Ali as a man might smile at a boy. The Giant’s face flushed with anger. With a cry of rage he sprang off his horse, displaying a degree of agility surprising in so huge a monster. He hamstrung his horse, drew his sword and rushed at Ali. The fight was on. Amr struck at Ali many times, but Ali remained unharmed. He would parry the blow with his sword or shield or nimbly step aside to let the Giant’s sword whistle past him harmlessly. At last the Giant stood back, panting and baffled. He wondered how this could be. Never before had any man survived so long in personal combat against him. And now this boy was looking at him as if he was playing a game! Then things happened so fast that no one could quite follow the sequence-neither the Muslims nor the Quraish nor the Giant himself. Ali dropped his sword and shield to the ground; his body shot through the air like a missile and his hands grasped the Giant’s throat; with a wrestler’s kick he knocked the Giant off balance, and the Giant came crashing to the ground-all in a matter of seconds. Now the Giant lay on his back with Ali sitting astride his chest. The two armies gasped and murmured, then held their breath. The bewilderment on the Giant’s face changed to fury. At last he had been thrown, and by this young upstart who was less than half his size! But although he was down, he was not finished. He would still win the battle and re-establish his position as the greatest warrior in Arabia. He would toss this youngster into the air as a leaf is tossed by the wind. The Giant’s face went purple, the veins stood out on his neck and his huge biceps and forearms trembled as he strained to break Ali’s grip. But he could not move it an inch. There was the quality of steel in the muscles of Ali. “Know, O Amr”, said Ali gently, “that victory and defeat depend upon the will of Allah. Accept Islam! Thus not only will your life be spared, but you will also enjoy the blessings of Allah in this life and the next.” Ali drew a sharp dagger from his waistband and held it close to Amr’s throat. But this was more than the Giant could take. Was he whom Arabia considered her greatest champion to live the rest of his life under the shadow of defeat and disgrace? Was it to be said of him that he saved his life in personal combat by submitting to the conditions of his opponent? No! He, Amr bin Abdu Wud, had lived by the sword. He would perish by the sword. A life spent in violence must end with violence. He gathered the spittle in his mouth and spat into the face of Ali! He knew what would happen. He knew that there would be a sharp intake of breath, that Ali’s right arm would shoot into the air and then plunge the dagger into his throat. Amr was a brave man and could face death without flinching. He arched his back and raised his chin to offer his throat to Ali, for he knew what was to come. At least he thought he knew! The Giant rose. But there was no question of his returning to his people a loser. He would live a victor, or not at all. Intending to make one last attempt at victory, he picked up his sword and rushed at Ali. Perhaps he would catch Ali unawares. Ali had just enough time to pick up his sword and shield and prepare for the fresh assault. The blow which the Giant now delivered in furious desperation was the most savage blow of the encounter. His sword shattered Ali’s shield, but in doing so lost its force and impetus, and could then do no more than inflict a shallow cut on Ali’s temple. The wound was too slight to worry Ali. Before the Giant could raise his sword again, the Zulfiqar flashed in the sunlight, and it’s tip slashed open the Giant’s throat. The blood of the Giant gushed forth like a fountain. For a moment the Giant stood motionless. Then his body began to sway as if he was drunk. And then he fell on his face with a crash and lay still. The earth did not shake with the impact of that colossal body. The earth is too big. But the hill of Sil’a shook with the cry of Allah-o-Akbar that thundered from 2,000 Muslim throats. The triumphant cry echoed through the length and breadth of the valley before it faded away into the stillness of the desert. The Muslim group now rushed at the six remaining Quraish. In the sword fighting that ensued, one more Quraish was killed and one Muslim fell. A few minutes later the Quraish group turned and hastily withdrew across the ditch. Ikrimah dropped his spear as he jumped the ditch, on which Hassaan the Poet wrote many a rude verse. A man known as Nofal bin Abdullah, a cousin of Khalid’s, was not successful in clearing the ditch and fell into it. Before he could rise, the Muslims were on the bank and hurling stones at him. Nofal wailed, “O Arabs! Surely death is better than this!” Thereupon Ali obliged the man by descending into the ditch and cutting off his head. When the secret no longer stayed a secret! Abdullah bin Mubarak relates, “‘Once while I was in Makkah, we were struck with a severe drought. It had not rained for weeks and all the people gathered in Masjid al-Haram to pray for rain. I was also amongst them sitting next to the gate of Banu Saiba. An Ethiopian slave wearing tatty garments came and sat in front of me. I could hear him praying, “Oh Allah, bad deeds and sinning have frayed the faces and you have stopped showering us with your mercy to teach mankind a lesson. I ask you Oh Haleem, Oh Raheem, Oh One whose people know nothing except good. Send rain unto us this moment”. He prayed until the clouds appeared and it rained. When he left I followed him to find out his whereabouts. On returning home I went to see Fudail bin Ayaz who asked me why I was depressed. I related the incident, he then insisted that I take him to this Young man. “It is late, let me find out more about him” I told him. He then said, “Life was good when the secret was between my Lord and I. Now you know and then someone else will come to know. Now I am no longer in need of this life.” He fell down and began to say, ”Oh Allah take me now.” I came close to him and found him still. He had passed away.